On the list of reasons why I admire Research In Motion’s (RIM) BlackBerry operating system (OS), the sheer number of built-in, valuable keyboard shortcuts ranks near the top. These tricks help you navigate your devices and data, as well as the Web, as quickly and efficiently as possible. 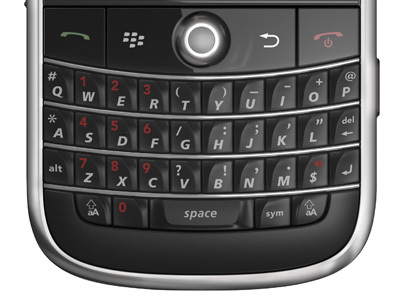 In fact, your BlackBerry’s literally packing hundreds of “hidden” tips and tricks, many of which I’ve already uncovered with the help of high-level mobile gurus–even RIM’s co-CEO. Jump to the Top or Bottom of a Web Page: To jump instantly to the very top or bottom or a Web page within your BlackBerry browser, simply click the “T” button to move all the way up or the “B” key to shift to the bottom. To jump down a page length in the BlackBerry Browser, simply hit the Space key. Do so repeatedly to quickly move down a page. On the flip side, you can “page up” by holding a Shift key and then clicking Space. This is a great way to reduce wear and tear on your BlackBerry’s trackball–though replacement trackballs, in a rainbow of colors, aren’t exactly hard to come by or install. The simplest and fastest way to surf to your home page via BlackBerry Browser: click your “H” key while on another page. 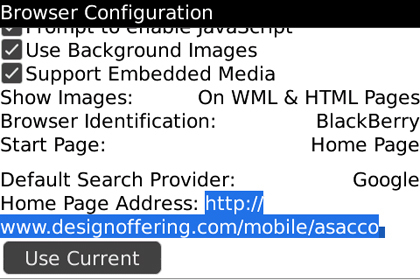 (Note: Modify your BlackBerry home page by hitting Menu–directly to the left of your trackball–and choosing Options, then Browser Configuration. On the following screen, scroll down to the Home Page Address field and enter in the correct URL for your new home page. Display Browser Options with a Single Click: Open up your BlackBerry Browser Options by hitting the “S” key while on any Web page. To refresh any page in your BlackBerry Browser, click the “R” key. To stop a page refresh, hit your Escape key. 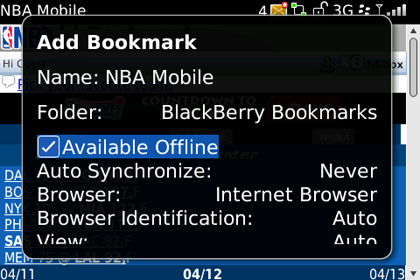 Quickly display your BlackBerry Bookmarks by clicking “K” at any point while on a Web page. Create a new BlackBerry bookmark by hitting your “A” button while on the Web page you wish to add to your list. Set the appropriate options in the following pop-up box, hit save and you’re good to go. To instantly view your BlackBerry browsing history, click the “Y” key while surfing the Web. To rapidly determine the URL for a Web page you’re visiting, click the “P” key. A prompt will appear that displays the page address and asks if you’d like to either copy the URL or send it via e-mail. Instantly Open “Go To” Page: The BlackBerry “Go To” page displays a URL bar for specific page addresses, a search bar, your bookmarks list and BlackBerry history. You can access the page via your BlackBerry Menu key, but there is also a quicker way: Just hit your “G” key on any Web page. You’ll see two basic views available in the BlackBerry browser: Column View and Page View. Column View condenses the content of Web pages into a single column that should fit the width of your device’s screen–though it doesn’t always work perfectly. Page View renders Web pages more like a desktop browser might, allowing you to scroll around left and right instead of viewing a single column page. 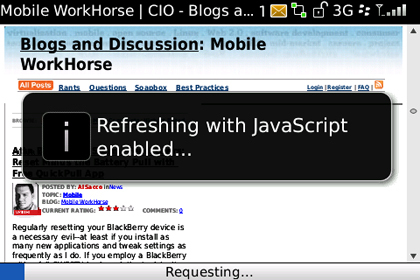 By default, your BlackBerry will be set to display the Page View. To switch back and forth between the two, click your “Z” button. By default, the BlackBerry Browser is set to display a thin banner across the top of Web pages, but you can get rid of it to free up more screen real estate. To do so, click the “U” key while on any Web page. The banner shows the title of the page you’re visiting, along with device status information, such as the number of unread messages and network signal status, so you might want it. To display the banner again after removing it, just hit “U” once more. As with a desktop browser, you can search for specific text on a Web page via BlackBerry browser. Hit “V” or “F,” type in the text you’re looking for and click the trackball. You’ll be directed to the first appearance of the text on the page, assuming it appears there. You can then continue to hit “V” to see where else the text shows up on the page. Owning an iPhone makes you "happier and more productive"